For a Maltese living in Belgium, this World Cup presents a new reality. Away from an island which is obsessed by football but whose national team would be lucky to win one match during the qualifying rounds, the decision as to which country to support as the greatest show on earth is about to kick-off is not a trivial one. Firstly, these are countries not clubs so normally everyone sides for his home country. But back in Malta, 40 per cent will be routing for England, the other 40 per cent for Italy with the rest supporting teams like Germany, Brazil or the Netherlands. For many years, particularly when I lived in Malta my favourite team during such competitions used to be Germany. The team was more or less a sure bet and I particularly liked their resilience and temperament during major tournaments. Living away from your country changes your perspective. So to those asking who I will be routing for this World Cup the answer is pretty simple. Belgium is not my home country, that will always remain Malta. But for nearly nine years, Belgium has been the place I call home, the place where my children where born, where I have made many new friends and where I now feel nearly if not more at home than in my home country. So, this year Belgium it will be. The football fever can be felt everywhere in the streets. Radio stations play World Cup tunes, all adverts in the streets are football related as are the adverts on TV stations. People have covered car mirrors in Belgian flags. Wherever you go in shops and supermarkets, people are talking about the Diables Rouges and getting excited about the team’s possibilities. The young Belgian team which is made up of football stars playing top flight football in England, Italy, Spain and Germany will probably not even reach its peak in this World Cup. Most players are still very young and will gain strength from experience. 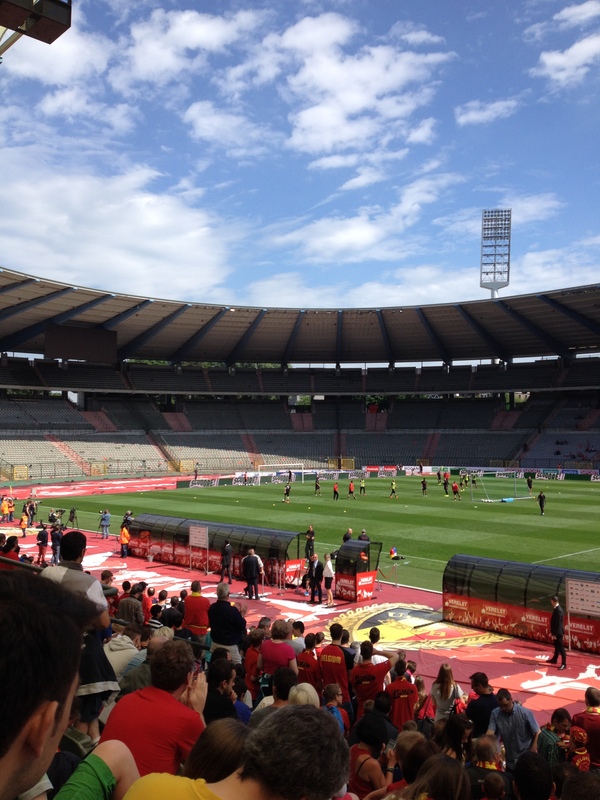 This morning I went to watch a training session of the Red Devils before their departure to Brazil. The atmosphere in the Roi Baudouin stadium was electrifying. A crowd of over 3,000 people must have turned up to cheer the team before their long journey to Brazil. Am I expecting Belgium to win the World Cup? No, that will likely be a South American team as has always happened in the World Cup’s history whenever the World Cup has been played in the South America. What I am expecting is for the Red Devils to be among the most exciting teams of this World Cup. With players like Hazard, Kompany, Lukaku, Mertens and Courtois to mention a few names, it is no wonder that expectations are high.